I work in the Department of Mathematics and Statistics at Colby College. The links will take you to the department home page and the Colby home page. There’s also an official professional profile page. In the Spring of 2019 I am teaching Linear Algebra MA 253 and History of Mathematics MA376. Clicking on the course numbers will take you to the web page for the course. If you need to see me at a different time, please email me to make an appointment. Note that I am almost never on campus on Thursdays. Sometimes I feel preachy. Here are my notes for majors. If you need a letter of recommendation, please email me. If I agree to write a letter, I may ask you for more information; the more you can provide, the better. From 2000 to 2019 I was the editor of the Mathematical Association of America’s online book review service, MAA Reviews. I am still involved, but no longer as editor. As you might expect, I am a fan of the site! This is the place to go for mathematics books: what’s out there, is it any good, what’s recommended for library acquisition. Please visit! There is an RSS Feed as well. Read the reviews, buy the books. Tell all your friends! Math through the Ages: A Gentle History for Teachers and Others, which I wrote together with Bill Berlinghoff, was originally published by Oxton House Publishers in mid-2002. The second edition appeared late in 2014 (originally from Oxton House) and (in the “Expanded” version) 2015, from MAA Press. Tthe non-expanded version is now published by Dover. The book is an introduction to the history of mathematics with the needs of mathematics teachers chiefly in mind. But it’s not just for teachers; if you would like to begin to learn about the history of mathematics, we think this short and readable book is a good place to start. The expanded edition has a prettier cover. The expanded edition includes problems and projects. The expanded edition is published by MAA Press (an imprint of the AMS). If you adopt the expanded edition as a text, you can get a free copy of the Instructor’s Guide. Apart from this, the two versions are identical. The goal of Math through the Ages is to be both readable and correct, to serve as a “gentle” textbook that you can rely on. The Dover version is very affordable; buy copies for all your friends! Pathways from the Past is an offshoot from Math through the Ages. There are two volumes. Each contains historically-based worksheets that teachers can use to teach mathematics. Each set of worksheets comes with a 64-page teacher’s manual that provides historical background and some guidance on how to use this material in class. There are two sets of worksheets. Pathways I focuses on Numbers, Numerals, and Arithmetic, while Pathways II is about Algebra. Both sets are available from Oxton House. Math through the Ages has been translated into four other languages so far; you can see the covers of those editions above. 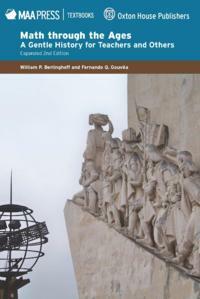 A Guide to Groups, Rings, and Fields is a survey of graduate algebra, aimed principally at those who want to review the subject. Aside from a couple of broadly introductory chapters, the book looks at groups, group actions, and group representation; rings and their modules; fields, skew fields, and Galois theory. The original vision for this book was that it might serve as a refresher and/or review, either for graduate students preparing for their quals or for professionals in other parts of mathematics. There are no proofs, but I hope readers will find it a useful overview of the material. The link takes you to the main page for the book, where I also keep a list of currently-known errors and misprints. 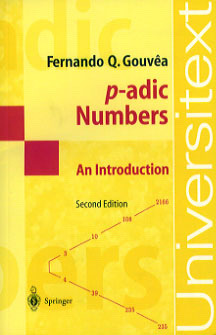 P-adic Numbers: the corrected third printing of the second edition of my book p-adic Numbers: An Introduction came out in mid-2003. The book is an introduction to p-adic numbers and p-adic analysis aimed at mathematics undergraduates. It tries to be open up the theory to the reader in a friendly and accessible way. Check here for (a few) errata, notes, and other comments about the book. I’m hoping to produce a third edition in the next couple of years, so let me know if you have found any errors or have suggestions. One of the plans for the third edition is to include a little more on the history of the p-adic numbers, and maybe something on Witt vectors. If you have suggestions and/or comments, send them on. Arithmetic of p-adic Modular Forms was my first book, based on my PhD thesis. It is desperately out-of-date, since the field has progressed a lot since I wrote it in the late 1980s. In particular, nowadays one would want to approach the theory from Coleman’s point of view. I’ve written a lot of other stuff, of course. Here is the full list. Material available on the web: This page lists some material I’ve written and which is available on the web. Number Theory and Arithmetic Geometry, with a special focus on modular forms and Galois representations. As a spectator, rather than as an active player, I also try to keep in touch with lots of other fields in mathematics. Outside mathematics, I am interested in Christian theology, patristics, fountain pens, modern science fiction, literature and poetry, politics, wine, perfume, comic books, and lots of other things.